I had a lot of Feta cheese lazying around in the fridge. I love this cheese. Its salt, tangy and creamy. I don't want to get into where it is originally from because every country wants to claim it there own. But I don't judge those countries after all its Feta, whats not to pride in it. As I walk to the cheese section of our supermarkets, I see atleast 10 kinds of Feta from Saudi feta, French, to Greek to Egyptian.Each time I'm tempted to buy a different make. Now here's the thing, I find it embarrassing to ask the CHEESE GUY to let me sample each Feta each time. I'm even quite sure that he recognizes my face by now. Oh yes! its that bad. In his own mind is he thinking that I'm cheap lolo (no its not a word) trying to eat cheese for free? Hell no! ( As I walk the dates counter, I find it compulsive to pick one, eat and walk off) I always end up buying so I guess that's out of question. After taking a bite of 10 (sometimes 12), atleast he has the right to think I'm a saltoholic. Which I might be and is debatable. Which brings me to another question about salt? Should salt be mentioned as an ingredient in recipes ? I can't bring myself to write it as one. Its just OBVIOUS! But I read many a post where people end up commenting , " You forgot to mention the salt ". So what do you think? Salt or no Salt? French Feta, which is mostly made of sheep's milk and is mild(for me) and it is costliest. Then there is the Greeks, who make them with a combination of sheep and goat's milk. And I find it more like halloumi, which is more crumbly then creamy. Greek Feta holds better in salads.I do love some of that. Middle eastern Feta. Well there is no such feta. Here, we get Feta made of almost every middle eastern country and I just summed that up unfairly. They all taste different. Mostly made of sheep's milk, they are more salty and creamier than others.I'm beginning to settle for what might be my favorite make of Feta which I think ( I do that alot) is Saudi Feta Cheese.This one has just the right amount of salt, so that you can have on its own and still don't feel your pressure rising up.Its creamy if you spread it on your toast, and crumbles if you drain out most of the salty brine. ( By the way I hate using those bullets up there, it reminds me of pile ups of projects I need to get back to ) Anyway so I revisited the Garlic Halloumi Pull aparts I made a while back and had assured myself I'll come around it again. I finally did.
" Some may disagree with the EU PDO ruling , but it would be hard to argue that Greeks don't know something about Feta. Experience counts." *I reduced the Feta cheese and hiked up the mozzarella here because even though I want Feta in there, its good to remember that Zaatar and olives are going to be salty too. Too much Feta will make it way to salty (which is fine by me). Infact if your feta is more salty you can reduce it further. Its always good to taste your filling before you fill it. ** If you don't know what Zaatar is, read about it here. You should be able to find zaatar in any middle eastern grocery store. If not, I guess I would have used 1/2 tsp of crushed dried thyme, 1/2 tsp of dried oregano, 1/2 tsp sesame seeds and and 1/4 tsp of sumac. In a medium size bowl, add 1/4 olive oil , sugar and yeast. Add the lukewarm water(not hot) and mix. Let it stand for 10 minutes. This is what happens to it after 10 minutes. Did it happen for you ? No? then your yeast has died an untimely death. But instead of crying over it you will have to give life to some new yeast. So back and repeat! 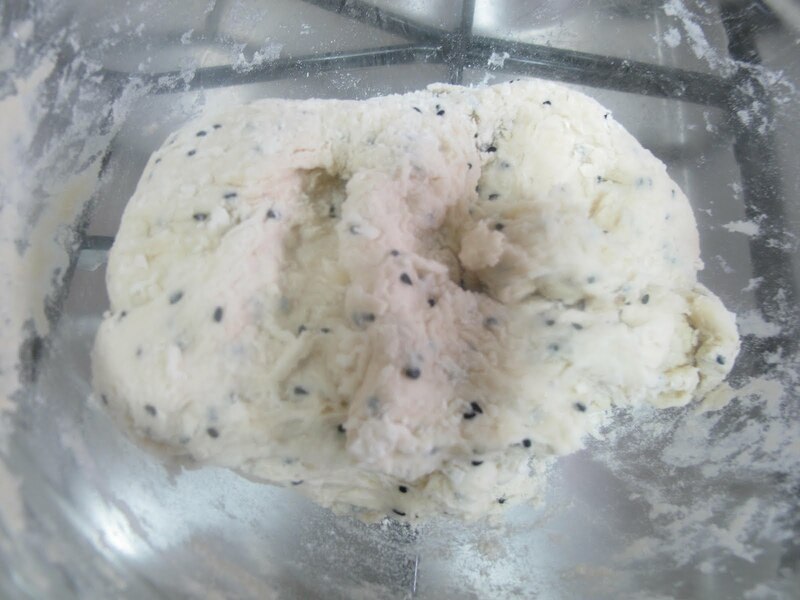 In a large bowl, add the flour, nigella seeds and salt. Add the yeast mixture and combine.It should form a relatively dry dough. Bang it on your work surface and knead for about 5-7 minutes. Until it becomes nice and smooth. Roll the dough in some live oil and place it a large bowl. Cover with a clean damp kitchen towel and keep in dry, warm place. Meanwhile lets prepare the filling. Grate the cheeses and separate them into two bowls for two different fillings. Reserve 1/4 cup of cheese for later. For filling 1, chop the mint,chilly and parsley and add to the cheese. And don't forget the garlic. For filling two, add the garlic, zaatar and olives. Lets get back to dough, it should double in volume. Mine did in just about an hour. Yours could be a lazy yeast or you live more humane climate where the temperatures don't go up to 55 C in summers ( just saying) then it might take more time. Divide the dough into 25-30 equal size balls. Take a good heaping tbsp of filling and place it in the center. Bundle it up to close the ball. Its also a good time to preheat the oven at 200 C.
Now holding on the seam side dip it into some olive oil and place it on your baking tray (seam side down). I used a spring form pan. You can use any baking tray with tall edges. Cover and let it rise again. About an hour or less. And tuck them back into the oven for another 10 minutes. And Voila! Let them cool before you grab one of those garlicky, cheesy nuggets of love. In every bite, the Feta shines. And it doesn't help that there is that oozy mozzarella with each bite (when they are still warm which they are not in the pictures) . And garlic. Enough... GOT TO GO! Wow That looks fantastic!! Great job . I am so much in love with such homemade pavs & the smell of the freshly baked ones! 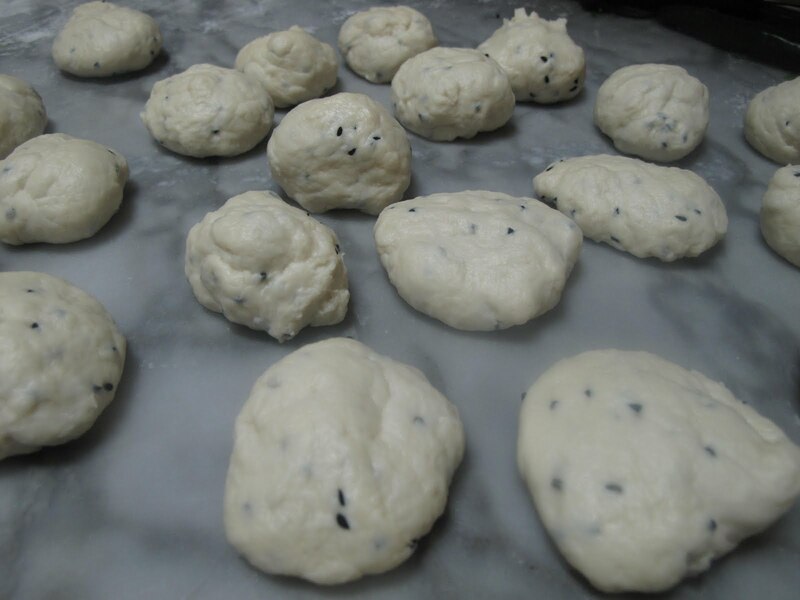 But havent tried the flavored ones as yet.I make plain ones to go alongside bhaji! This looks delicious. I love the step by step photos. There is nothing better than fresh baked bread is there? If only my kitchen were bigger as I'd love to be able to do step by step photos but I barely have room to turn around. This is a wonderful looking bread with as wonderful flavors. makes me think of the monkey bread. perfect! Oh! yes there is nothing like freshly baked bread and the aroma is ecstatic for me. And guess what? My kitchen can't fit more than 2 people quite literally. But I find it almost compulsive to use step by step photos. About 3 years ago when I started cooking, I always felt scared if I was doing something wrong when following a recipe. Pictures just makes it easier. By the way hows your knee coming around? Hope your doing better! Love monkey bread. May be that's next on my list ;). Thanks for stopping by. Love your blog. These look FAB! Absolutely glorious! This is gorgeous! I can't even imagine how amazing it smelled! OK, YOU are a find. LOVE your style. The writing, the rambling, the recipe, the photos, the CHEESE GUY, the dates, love it all. Will definitely make. FABULOUS. Thank you for being a blogger and for making my day. Super recipe! I can't wait to make this! Ps. Greeks loves you!! Bread rolls look absolutely fabulous.Just got a bag of Zaatar and this seems like the perfect recipe to start using it. Thanks for the recipe. Wow these look so delish!..really tempting K! They truly look addictive! Regarding the salt: I think it should be listed. I am an accomplished baker. However, many are not, and infrequently do so. If one hasn't any experience with the recipe, or one similar, it just wouldn't occur to them to use it. I think that just because its something that you and I may use all the time (as with water), it doesn't make it any less an ingredient. Awesome article!!! I say put salt in the recipe if you think there are my layers to the recipe. People new to a cuisine need a little bit extra info to realize when to put in the salt and why. So I always have a suggested salt quantity. Rest depends on personal taste! !